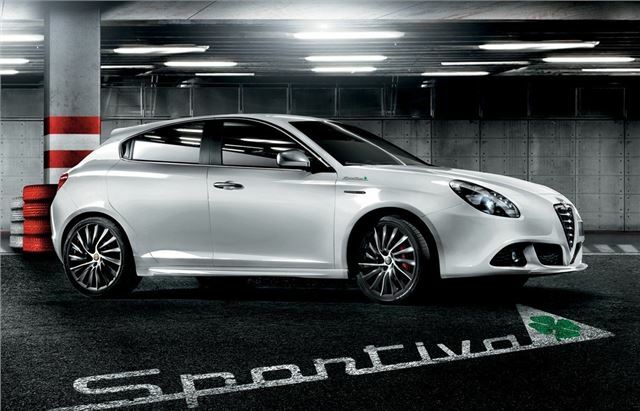 Alfa Romeo has added a Sportiva trim level which is available on the MiTo and Giulietta. Based on top of the range versions of both cars, the new trim adds plenty of extras including 18-inch alloys and sports seats. The MiTo comes with £1500 worth of extras at a cost of £750 extra. These include 18-inch Quadrifoglio Verde alloy wheels and sports kick plate. Inside, the theme is black and green with dark headlining, and matte black steering wheel inserts along with a leather steering wheel, plus black Alcantara sport seat upholstery – all finished with green stitching. The Alfa MiTo Sportiva is available with three engine options: the 875cc TwinAir 85bhp priced at £16,100, the 1.4 MultiAir 135bhp at £17,000 and the impressive 1.6 JTDM-2 diesel with 120bhp which costs £17,750 on the road. Meanwhile the Giulietta Sportiva is based on the Veloce trim and adds red Brembo brake calipers, 18-inch alloys with a dark titanium finish, leather upholstery plus a rear armrest with a storage compartment. In total, the Sportiva gets £3000 worth of extras for an additional cost of £1860. The Alfa Giulietta Sportiva is available with a choice of six engines including the new technologically advanced twin dry-clutch semi-automatic ALFA TCT, starting at £23,110 for the 1.6 JTDM-2 105bhp.